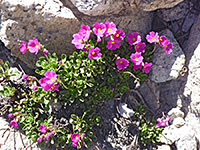 A paved, 13 mile road leaves the little town of Independence on US 395 in the middle of Owens Valley and climbs over 5,000 feet to Onion Valley, a grassy, partly wooded basin along the upper reaches of Independence Creek, surrounded on three sides by jagged granite slopes rising to 13,000 feet. The trailhead at road's end is one of the most popular in the eastern Sierra since it accesses spectacular scenery and is closest to the mountain crest - 11,760 foot Kearsarge Pass is just 4 miles away, beyond which the path enters Kings Canyon National Park and soon meets the Pacific Crest Trail, from where many other destinations are within range of overnight hikes. Onion Valley is also one end of the shortest road-to-road cross Sierra hike, the other end being Kings Canyon Road from Cedar Grove - a trip of 18 miles, mostly along Bubbs Creek Trail, and so achievable in one day, though a very long car shuttle would be needed to return to the trailhead (310 miles). For day hikers, Kearsarge Pass is the main destination (4 miles), and the four scenic lakes en route, with other options being to descend a little way into Kings Canyon National Park to the Kearsarge Lakes, to climb the nearby summit of Mt Scott (off-trail), or to take a much less traveled path to Golden Trout Lake, in a side canyon north of Onion Valley. 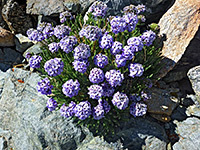 The loop hike described below is an ascent to the pass and Mt Scott, then descending a scree slope to Golden Trout Lake and returning via the lake's trail - a varied round trip of just over 8 miles. 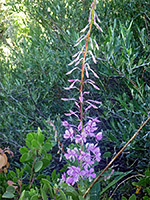 35 views along the trail - gallery, slideshow. 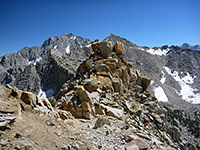 Panorama from the summit of Mt Gould. 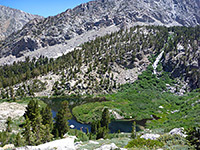 Onion Valley Road starts as Market Street in Independence, climbing gently at first over the barren plains on the west side of Owens Valley, past two Inyo National Forest campgrounds (at Seven Pines) then beginning a winding ascent into the Sierra foothills. The road zig-zags up the steepening hillside and enters the lower end of Independence Creek valley, later rising some way above via more switchbacks, before levelling out and ending at a large, circular parking area, elevation 9,200 feet. Spurs lead to a small USFS campground and several stone buildings. The trail departs from the far side of the Onion Valley parking lot, rises up the hillside and rounds a point to an NPS sign announcing 'Kings Canyon National Park, 5 miles' (the distance is actually 4 miles). A waterfall comes into view quite high above, in the adjoining canyon to the north, and a junction is reached soon after, with the lightly used path that climbs this ravine, reaching Golden Trout Lake after 2 miles. 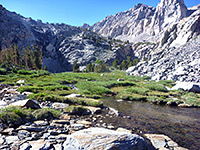 The main trail ascends some more, past the John Muir Wilderness boundary, then starts a series of switchbacks, moving gradually closer to the stream that flows through the valley. The surroundings are exposed, mostly lacking trees, and can be hot in summer, but become wooded when the first of four lakes appears (Little Pothole Lake), a crescent-shaped pond fed by two tributary streams with waterfalls, tumbling down the sloping hillsides to the south. 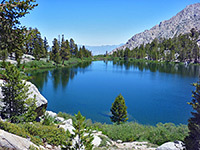 The trail has many more switchbacks, across bushy, grassy slopes, before crossing a short overgrown area and emerging to a big pile of boulders, which leads to the larger Gilbert Lake, enclosed by a ring of trees and rocky outcrops. The higher mountains to the west are clearly visible now, still up to 2,500 feet above. After a shorter ascent through thinning woodland, a spur path branches off southwards to Matlock Lake, soon after which Flower Lake is visible to the south, reachable if desired by a walk of 200 feet through the trees. 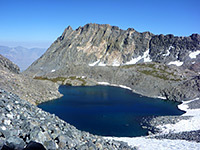 The surroundings become ever less forested, the ground now littered with large white granite boulders, as switchbacks take the path north towards a wide wall of scree and granite; the route curves around to the base and traverses to the top, giving views of Heart Lake, 300 feet below. Some not so steep switchbacks lead across a boulder-strewn hillside and out into a treeless bowl, the last section before Kearsarge Pass, which is now visible straight ahead. This is one of the prettiest parts of the route, enclosed by crisp granite cliffs and filled with wildflowers in summer, sustained by pools of melting snow, while ahead lies the circular Big Pothole Lake, bearing ice most of the year. 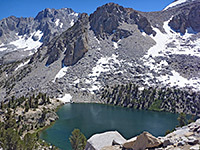 The trail rises steadily up the north side of the basin to the 11,760 foot pass, beyond which several more lakes (Kearsarge and Bullfrog) come into view, in Kings Canyon National Park. 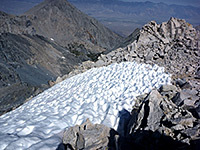 Beyond, in the distance to the west, the land is noticeably more wooded, due to the lower elevations but to the north and especially south (Kearsarge Pinnacles and Kern Divide) the landscape is entirely stark granite, with jagged ridges and barren cliff faces, and much residual snow. The pass is the usual turn around point for day hikes; the round trip down to the Kearsarge Lakes adds another 3 miles, while the off-trail continuation route to Golden Trout Lake is due north, up the side of Mt Gould. 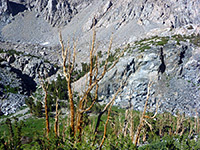 A steep scree slope rises beside Kearsarge Pass, leading to the summit of Mt Gould, 1,200 feet above. The gradient is constant and the surface underfoot is formed of firm rocks, becoming larger and more jagged towards the top. A faint path winds between the some of boulders but this is slippery in places due to loose earth so the hike is easiest via the boulders. 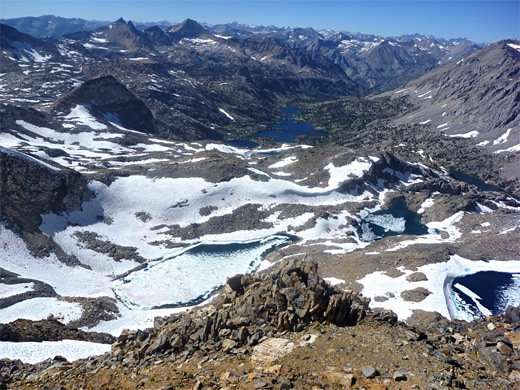 The summit is formed of piles of fractured, white/brown granite, and it overlooks a vast area of the Sierras; a complete 360° panorama except for the north, where some of the distant landscape is blocked by a triangular, stony plateau, 200 feet below. 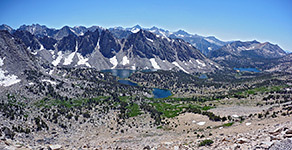 This is reached after a few minutes descent, and gives a different view from each edge - east towards Golden Trout Lake and Owens Valley, southwest to the Kearsarge Lakes, and best of all to the north, to the several glacial ponds, Rae Lakes and many peaks beyond - see panorama. The route continues down the sloping ridgeline to the east, starting just below some communications equipment on the high point of the plateau. The descent is relatively easy, assisted via large, firmly-anchored rocks, leading into a rocky bowl where the gradient temporarily lessens, before another steep slope down some cliffs and more big boulders; a little hand to foot climbing is needed here but nothing very taxing. Golden Trout Lake is just below, supposedly reached by a trail that ends by its eastern edge, though this is barely discernible, especially early in the season when patches of snow remain. The route is straightforward, however, across a grassy meadow dotted with small boulders, beside the lake's exit stream then down a slope, as trees start to reappear. A brief steeper descent of a hillside with red-barked conifers, mostly dead, leads to a marshy area where another faint trail forks north, to two other rarely-seen lakes. The streamway is now quite overgrown, and steep-sided, with trees on the south side of the canyon and scree on the north. The path runs to the south, rising some way above before dropping down and crossing over to the north, zig-zagging down an open hillside, past a waterfall, to a moist, bushy area around the stream and on through a patch of trees to the junction with the main path to Kearsarge Pass, just a ten minute walk from the trailhead in Onion Valley.